I am pleased to share with you this Call for Papers I just received from Marc Battier, professor at IReMus / Université Paris-Sorbonne. Le colloque international Éliane Radigue a l’ambition de réaliser un panorama de l’œuvre de la pionnière de la musique électroacoustique française Éliane Radigue et d’inciter à la recherche sur les femmes compositrices du XXe et XXIe siècle. Le colloque est organisé par le CReIM (Cercle de recherche interdisciplinaire sur les musiciennes), le GEMM (Genre, Musique et Musiciennes) qui cherche à encourager les recherches sur les femmes dans le rôle de musiciennes, compositrices ou musicologues, l’IEC (Institut Emilie du Châtelet), ainsi que par l’IReMus (Institut de recherche en musicologie) et l’École doctorale Concepts et langages (ED V). So, I began with thoughts of focussing on Experimental Electronic Music and like most went down the route of the standard history that everyone charts. As some of you by now will realise, although I do post a lot about the well known electronic artists, genres and histories, I also try to give those well under the radar a space to get their music heard or the genre a wider audience. This includes trying to bring to attention the scene in the rest of the world. I had heard about Hugh Davies and his catalogue of ‘alternative electronic history’ but until today had not had a chance to explore further. So glad I did ! As I knew in my heart, there was and still is an alternative electronic music scene and one where many artists are quietly creating music unknown or ignored. This is why I am reblogging this article as part of the Experimental Season, as many of the themes are still so relevant today and why Hugh Davies’ work is still vital as a challenge to the traditional historical theory. Listening to the Soundcloud discussion is recommended as it gives an insight into roles of Daphne Oram ad Delia Derbyshire in the development of British electronic music and technology. Some interesting questions and answers. In February 2015, a concert of tape music works by Delia Derbyshire and Daphne Oram was staged as part of the Electric Spring Festival at University of Huddersfield. The concert was preceded by a public conversation between the curator of the concert, Dr James Mooney, and one of the festival’s artistic directors, Prof Monty Adkins. A complete recording of this pre-concert discussion is now available via SoundCloud: click here. 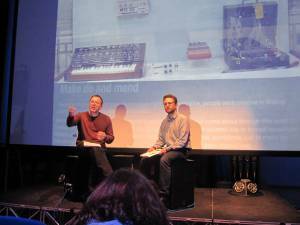 The conversation addressed the context of electronic music in Britain in the 1950s and 60s and included discussion of Hugh Davies, his self-built instruments and – in particular – his International Electronic Music Catalog. The tools and techniques of electronic music production in the 50s and 60s were discussed, as was the institutional context of the BBC Radiophonic Workshop, where both Derbyshire and Oram worked.